The Control 25T is perhaps the most versatile of JBL Professional’s Control Contractor Series indoor/outdoor loudspeakers. Its robust nature makes the Control 25T a perfect choice for restaurants, health clubs, outdoor theme and water parks or other applications where foreground/background music and paging are required. 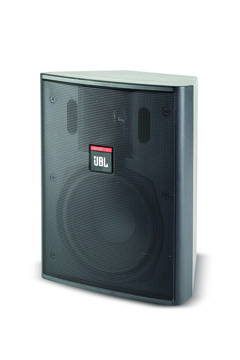 The Control 25T can be used in either 70.7V or 100V distributed line sound systems. Taps are provided at 30W, 15W and 7.5W. Isolation transformer for 70.7 V / 100 V distributed-line sound systems. Components: 5.25 in Polypropylene coated woofer, .75 in Titanium coated horn loaded tweeter. Weather resistant enclosure and transducers. 90° x 90° high frequency horn.